How do I create a Mail Merge template in MS Word? You can create a MS Word Mail Merge template that can then be uploaded into Wealthbox to print letters or other documents with fields inserted from Wealthbox. Note: be sure you save the Word file as a document, not a template format. Open MS Word and choose a new document or an existing document that you would like to use as a Mail Merge template. Click the “Insert” tab from the Menu bar and choose “Field” from the “Quick Parts” list. Choose “Mail Merge” from the “Categories” list. Select “MergeField” from the “Field names” list. 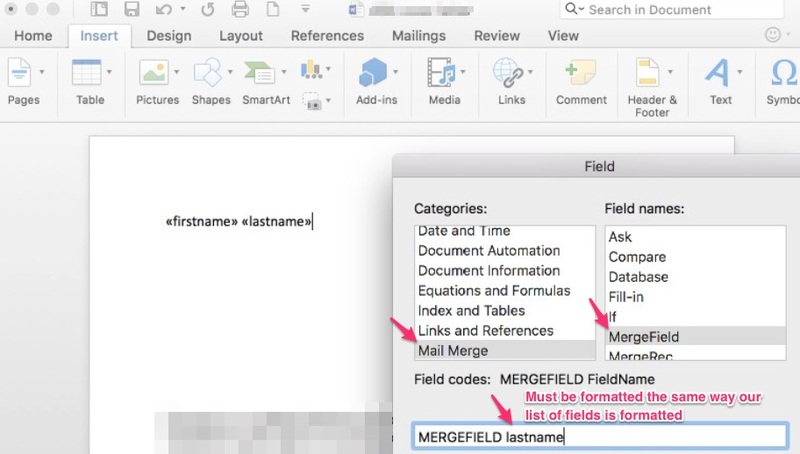 Within the “Field Properties” section, enter a Mail Merge field in the “Field name” box. Click here to see the available Mail Merge fields from Wealthbox. 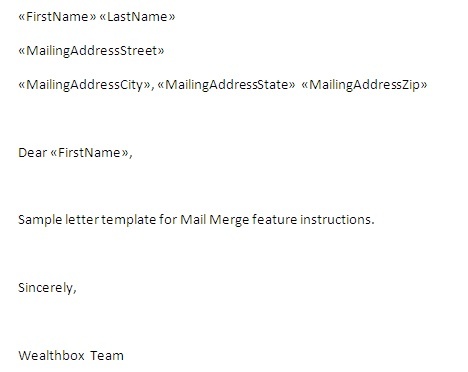 NOTE: Copying and pasting the allowed Mail Merge fields will not work properly when conducting a Mail Merge within Wealthbox. The above steps are necessary when creating your templates within MS Word. Your template will look something like the following example, which can be saved and uploaded within the Wealthbox settings for future use. See also: Can I create a Mail Merge directly from Wealthbox?